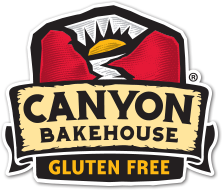 Canyon Bakehouse has released three new products!! I was very excited to have all three products sent to me for free in exchange for an honest review and the same three products to giveaway to one lucky reader! (Find the giveaway at the bottom of this post.) I was not paid for this review and all opinions are 100% mine. Everything Bagels, Plain Bagels and Brownies. Similar to their existing gluten-free breads, the new brownies and bagels are made with 100% whole grains and have a taste and texture just like “real” bagels and brownies. · Made with 100% whole grains and real food ingredients such as extra virgin olive oil, organic agave and eggs. · No artificial additives and fillers. · Certified Gluten-Free and do not contain dairy, soy or nuts. "Toasted or straight from the bag. Smothered in cream cheese or topped with an egg. Now, the only hard thing about a gluten-free bagel is choosing how to top it! Made with 100% whole grains and no GMOs, you can enjoy the goodness of gluten-free without compromise!" "Our new gluten-free Brownie Bites are the perfect size for satisfying sweet cravings without the guilt. Made with 100% whole grains and no GMOs, the decadent Brownie Bites make a great after-dinner dessert, grab-n-go snack, or can be enjoyed a la mode!" "We're proud to introduce our new Everything Bagels – a unique combination of soft, chewy texture with undeniably delicious flavor, any way you slice it. Enjoy the savory blend of garlic, onion, poppy and sunflower seeds - a gluten-free twist on a New York classic." This is not my first review of Canyon Bakehouse products. Please check out my raving reviews of their bread and muffins. I am a big breakfast person so getting bagels made me super stoked! I enjoyed the plain bagels with peanut butter and strawberry jam. I honestly can say that the flavor of the bagel is amazing... I really can't tell they are gluten free! Other ideas to add to the plain bagels include, other jams or eggs! As you can see in the picture above the everything bagel had a mouth watering makeover thanks to my husband! 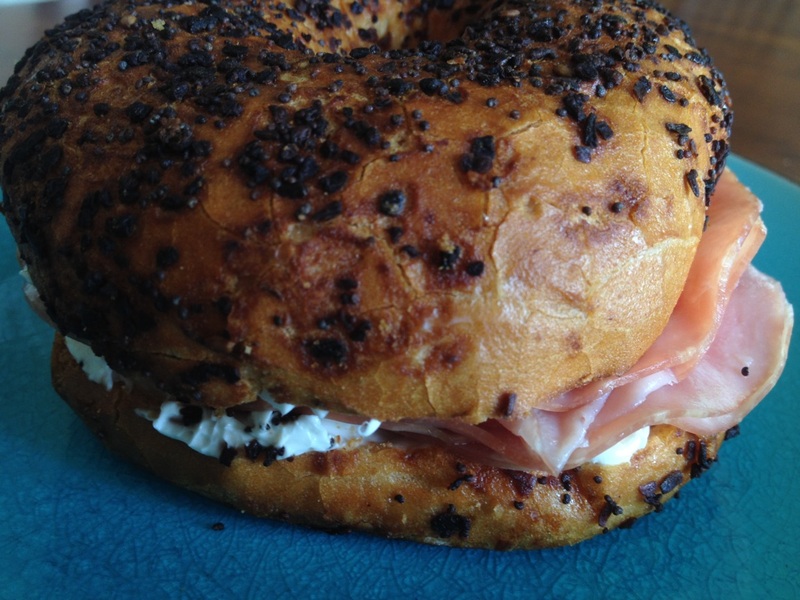 He created a savory cream cheese and ham Everything Bagel sandwich. It was delicious and again it is not noticeable that the bagel is gluten free! The brownie bites are very rich and moist so they did not last very long in my house. Canyon Bakehouse products can be purchased at Target's and online. They also sent me a personal letter to fill in and hand to other stores requesting more Canyon Bakehouse products to be in stock. Time to enter the giveaway below to win the brownie bites, plain bagels, and everything bagels. Use the easy Rafflecopter form below to enter! I really want to try the brownies. I'm most excited about the brownie bites! Yum! kristiedonelson(at)gmail(dot)com Thank you. They all sound yummy but I love everything bagels so I'd love to try these! They all sound good! I guess I'd pick the Everything Bagels first though. I am most interested in trying the brownie bites. I would pop them in the microwave and then throw some ice cream on top. I would like to try the everything bagels but they all sound delicious. I LOVE Canyon Bakehouse! Their everything bagels are my absolute favorite indulgence but I haven't tried the brownies yet and would love to. Thanks for the giveaway! I'd like to try their bagels! I'm most excited about the brownie bites! i am most excited to try the brownies. Oh I am most excited to try the Everything Bagels! I miss those! I'm most excited about the brownies! Oh man - I have to choose between the brownie bites and the everything bagels?! Don't make me choose! :) Thanks for the giveaway! I am most looking forward to the brownies! I'm most excited about the Brownie Bites! They sound divine. I have not seen anything but the bread in my local Target. Those Everything bagels are making my mouth water!